So this is the final week for the Sow the Seeds fundraising contest, and have I got a treat for you!! Jess has very generously offered up a couple of more prizes to the choices. Look what we have here!!! 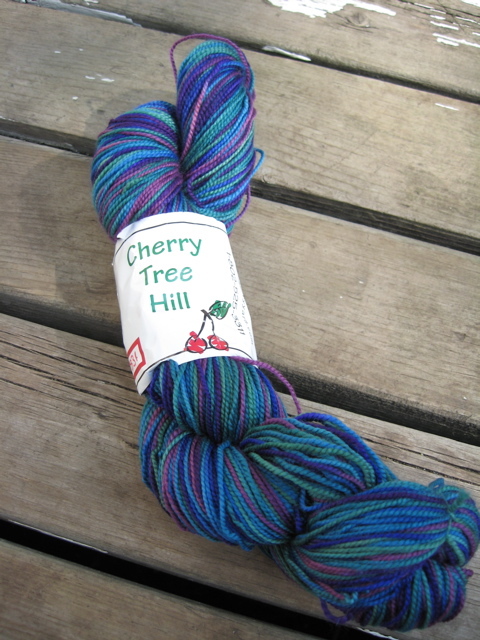 The first is a skein of her very own handspun, the second is Cherry Tree Hill. Add that to the choice of either Spunky Eclectic or Fleece Artist that I originally offered and now we’ll have three winners!!! Remember, all the contest info is over on the sidebar. I’m hoping we can get to at least $300 to help out our farmers. The final day to donate and enter is September 29th. Every dollar makes a difference and gets you an entry for some lovely yarn. And don’t forget to spread the word! In other news, Knitters’ Coffeeswap Three will be opening up on October first. I’m off to set up the new blog after this post, so I’ll put up the link once it’s ready. I’ve decided to have some hostess help this time. The last swap was just too overwhelming and a lot of work, but I know how much people have enjoyed it so I’d like to keep it going. Keep your eyes open and be ready to sign up. I expect that between the five of us we’ll take about 120 swap members, and those spots will go fast! I’m so bummed, I had a great sock/hat photoshoot this weekend with Knittybaby and my camera connector is nowhere to be seen, so until I figure out which certain small person has taken it I can’t show you my now completed Embossed Leaves socks. Did I mention that I picked up this book? Wrap Style and Lace Style didn’t jump out at me as much as Folk Style has. I think it’s the colors; they are just amazing and so beautifully put together. There is also a lot of interesting colorwork, embroidery and embellishments. As for the patterns, I love the Urban Hand Warmers and the Grand Tour Waistcoat. There are some great kids knits: some very cute mukluks and a couple of nice sweaters, and are you ready for this? A baby sling! I’m smitten with the idea of a knit baby sling, although I’m not sure how practical it is. If you were going to knit a baby carrier, I think a pouch would be much more practical than a sling. In order for a sling to work smoothly you need the fabric to slip easily through the rings so you can tighten and loosen it up. Plus, they should have used a model that actually knows how to carry a baby in a sling. She’s just sort of holding the baby in the sling rather than letting the sling do the work, so you can’t tell how well it holds. I don’t know…anyone ever knit a baby carrier?